The horror game Silent Hill 8, also called Silent Hill Downpour, is scheduled for release in October 2011, along with the Silent Hill HD Collection. More Silent Hill news inside! The new Evil Dead game for the iPhone is now available. Check out info on the Evil Dead app, including download links. 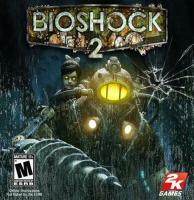 Brie reviews Bioshock 2 – sequel to Bioshock – a first person shooter developed by 2K Marin and Irrational Games for Xbox 360, PlayStation 3, and Windows PC. Horror Fan Zine guest reviewer MR3 tells you all you need to know about the awesome zombie-filled sequel to the cooperative first person shooter!